Seesmic dumps BlackBerry: Start of a stampede? 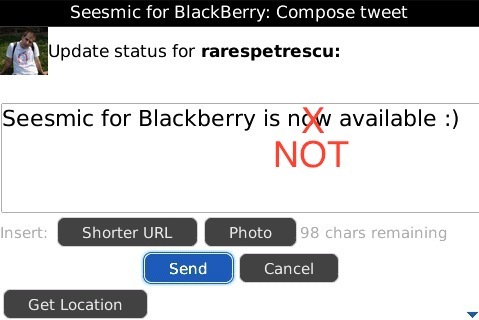 Seesmic, a popular third-party Twitter client for desktop and mobile devices, announced Monday it would end support for BlackBerry handsets at the end of June. In a blog post, the company shared the news, saying the reason for the decision is “in order to focus development efforts on our most popular mobile platforms: Android, iOS, and Windows Phone 7.” One developer certainly doesn’t make a trend, but given RIM’s (s rimm) slowing sales growth and lengthy transition to a new mobile smartphone platform, this could be the beginning of a terrible trend for BlackBerry devices. Based on a literal interpretation of Seesmic’s reasoning, it’s possible the application simply never became as popular on BlackBerry handsets as it is on those running other platforms. A quick check of Seesmic on the BlackBerry App World website shows a total of 516 reviews, with the average rating of 2.5 stars out of 5. But conventional wisdom dictates a developer would want to improve upon the app, not totally abandon it; unless, that is, the platform is too limiting, there isn’t much potential upside to making improvements, or both. We’ve written before about which will be the third major mobile platform behind Google Android (s goog) and Apple iOS (s aapl). The jury is still out, and while there’s room for multiple mobile operating systems, there will be dominant ones that benefit from application lock-in. It’s clear that Seesmic is betting on Microsoft’s Windows Phone 7 (s msft) system based on this move. So too are major research firms: In May, Gartner (s it) predicted Microsoft will surpass Apple for the no. 2 smartphone OS spot by 2015. Last week, IDC joined the bandwagon and said the same, mainly because of Microsoft’s new partnership with Nokia (s nok). We won’t know for some time if such projections are accurate, but we — and the folks at Seesmic — do have access to some current worrisome statistics related to RIM. The company reported lower than expected earnings last week (after it already lowered expectations previously) and suggested a challenging year ahead. RIM introduced a new and modern operating system in QNX, used for its PlayBook, and will be transitioning its smartphone lineup to the new platform in the future. But RIM hasn’t provided a clear timetable on such a move, and its latest BlackBerry handsets appear to be delayed. At this point, the BlackBerry operating system looks to be a legacy platform that will be a succeeded by an incompatible new platform at some unspecified future time. Device sales aren’t growing as fast as the general smartphone market, and even the company’s new tablet sales are under 500,000 total units after two months on the market. And even that number only represents the number of tablets shipped, not those sold. Again, one third-party developer dropping a platform doesn’t make a trend, but it could beginning of one, in light of the overall challenges RIM is now facing. GigaOM has a very smart team, I love them. Thatâ€™s why Iâ€™m surprised to see them following the mainstream view on this one – i.e. Seesmic dumping blackberry = the beginning of the end of Blackberry. If Iâ€™ve learned one thing itâ€™s that if all the analysts are saying the same thing, theyâ€™re probably looking in the wrong direction. RIM made $3,411,000,000 last year. Just because they aren’t growing at 40% a year anymore, they are done? I don’t know anyone that wants a Windows phone. Nokia made 1,850,000,000 last year. I’m pretty sure that blackberry’s new OS is better than the rest and yes, they are getting access to Android apps. RIM trades at 4.5X earnings. It’s not going anywhere unless it’s taken over which the founders could finance themselves since they only have to buy 85% of the company. You can finance the $4,000,000,000 in cash flow for $15,000,000,000. Windows phone 7 is a popular platform? I thought it was a third position straggling also ran? Seesmic for BB is mostly undifferentiated compared to the native BB twitter client that RIM ships pre-installed. It’s hardly surprising that nobody uses Seesmic’s client. RIMâ€™s new platform is said to support Android apps and this is probably planned to help bridge the app gap while adoption and refinement of their new platform is in its startup phase. Until WP7 has proved it can steal market share from BB and Nokia, it’s still a Android/iOS duo-poly. Agree totally with both Janet & Sivan. A more balanced and logical conclusion than the hyperbolae of the article. RIM makes an official Twitter app in partnership with Twitter. It’s actually very good and there’s little reason to use a third party app. If anything, this seems more an indication of the problems Seesmic is currently facing. Your comment makes absolute sense. Seismic is not telling the whole truth. Blackberry make super apps for Facebook and Twitter that you other apps on Blackberry Appworld can’t compete with. And no matter how much we beat RIM, it still has a solid install base across the enterprise and in Europe and increasingly Africa, RIM is growing at a pretty clip. You are forgetting something that we also know. RIM’s new platform is said to support Android apps and this is probably planned to help bridge the app gap while adoption and refinement of their new platform is in its startup phase. RIM is probably the #4 entrant or 5 depending on how Web OS/HP does. So Seismic can plan that their Android programming will be supported on the new RIM platform. They are just deciding to not invest further in the original blackberry platform which is being replaced so is a *dead* platform moving forward. Yes. Others will probably make similar decisions. Your analysis makes good sense. I remember Skype announcing they would discontinue their Windows Mobile efforts. I doubt they will neglect Windows Phone because of their new owners. In fact, Microsoft announced Skype support for the Mango update to Windows Phone before they bought Skype, IIRC. …or crackberry fans prefer a different twitter app? What’s become more and more obvious is that after RIM’s earnings call on Thursday, Windows Phone 7 has officially been anointed as the 3rd and final player in the smartphone OS wars.